This new trend is taking the wedding scene by storm! 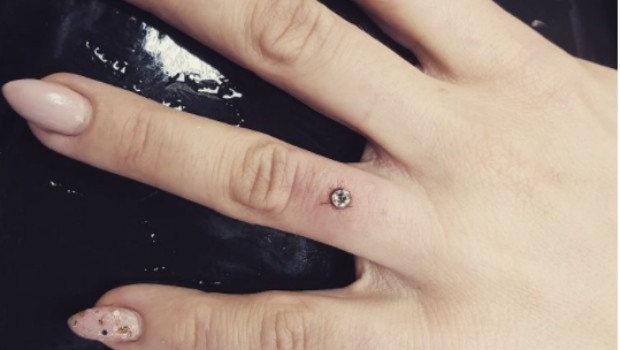 Newly engaged couples now declare their undying love for each other by getting diamonds pierced into their left finger in place of an engagement ring. According to Cosmopolitan, the dermal piercing is made up of a flat piece of metal that sits beneath the surface of the skin, and a visible stud that can be changed like any other body piercing. The piercing makes it look like the diamond or crystal is floating on top of the skin. “Micro dermal anchors are safe and the body will hold them for years, as long as they’re in ideal places and if implant-grade titanium is used,” professional body piercer Billy DeBerry told PeopleStyle. “They’re different than other piercings since it’s considered ‘surface work’. It really lets a person get away from traditional piercings like the ear or nose. However, these piercings might have been trending on Instagram, but dermatologists told Teen Vogue there are health risks surrounding dermal piercings. "The rejection rate is very high and the scarring can be pretty bad," professional piercer Adrian Castillo told Teen Vogue. "They sit on the surface of the skin so they’re very prone to get snagged." "Your hands go in your pockets, purses, jackets, shirts, towels, and all sorts of things multiple times a day. Ek is 'n gemaklike persoon. Wedersydse respek is eerste. Dit moet gemaklik en fun wees saam met mekaar. Ek hou van goeie tye en vakansie en om die wêreld te sien. Ek is spontaan lief vir die buite lewe. Ek is wie ek is en plat op die aarde. Groot bok vir sports.